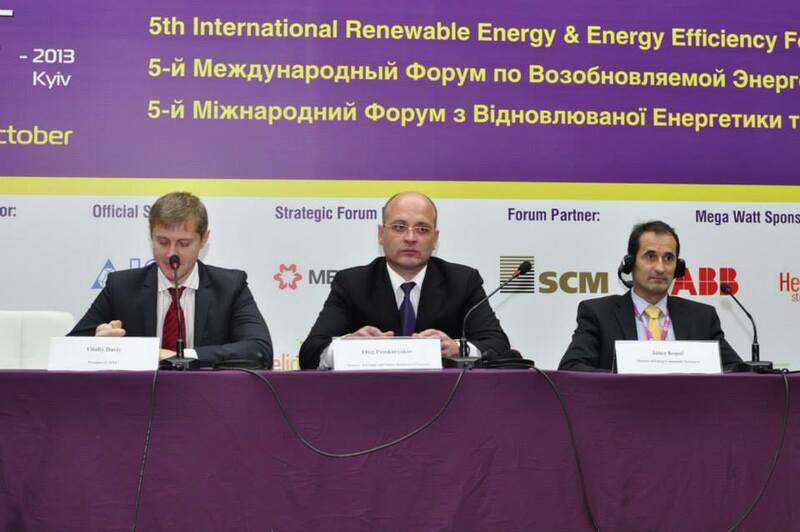 On 15-16 October 2013 Kyiv hosted the Fifth International Renewable Energy and Energy Efficiency Forum. Organized by the IBCentre and Association of Alternative Fuel and Energy Market Participants of Ukraine, this annual event has become a discussion platform for the key alternative energy stakeholders and regional experts in wind, solar, hydro and biomass energy matters, as well as issues of energy efficiency and smart grid. This year over 70 professionals had a unique opportunity to discuss key industry trends and potential, as well as legal framework and market risks. The increased significance of energy supplies matters and the economic perspectives of the Eastern European region make the topic of alternative energy resources particularly interesting to the readers of the European Sting. Energy efficiency has become one of the most important topics on the global economic and political agenda over the last few decades. An increase in gas and oil prices, financial turbulence, the shortage in energy sources, environmental pollution, and climate change problems have pushed the world community to seek alternative energy supply solutions. Taking into account its geographic and political position, Ukraine could not stay aside the world’s energy trends. Eduard Stavitskiy, the Minister of Energy and Coal Industry of Ukraine, opened the conference by stating that Ukraine aims to modernize its industries and bring them in line with the global greening approach. In the CIS, energy prices are not just a matter of business, but make up the core of much deeper political issues. With the Russian Federation holding an ultimate influence over regional policies and relations through its monopoly on gas supply, other countries in the region have began to understand the critical importance of alternative energy resources for their independence and economic well-being. Over the last five years Ukraine, in particular, has been at the forefront of the strife towards the implementation of green technology and innovative industrial solutions. As the second largest energy consumer in the CIS, Ukraine has the second largest energy saving potential. However, in order to meet internal energy demand Ukraine imports 75 % of energy resources. The dependence on Russian gas makes Ukraine particularly vulnerable, in both economic and political sense. The ‘price on gas’ has been used as a stranglehold in more than one negotiations process. At the same time, as Ricarda Rieger, UNDP Country Director pointed out, the government continues to give immense subsidies to household consumers, which impedes the development of the national energy sector and the overall economic recover of the country. This should be changed in order to achieve energy independence in the long-term perspective. Thus, the development in the use of alternative energy resources will increase Ukraine’s resilience towards external influences, allowing it not only to become a fully independent player on the regional political arena, but also helping the country’s economic growth. Ukraine is largely supported by the EU through technical assistance projects, twinning and grants. Sergiy Maslychenko of the European Bank for Reconstruction and Development (EBRD) stated that up to this date the European Bank for Reconstruction and Development (EBRD) has invested EUR 1.7 billions into sustainable energy in Ukraine, financing biomass, hydro, wind and solar technologies development. Moreover, Ukraine is on its way to sign the Association Agreement with the EU and is thus obliged to implement key EU directives into its national legislative framework. During the working sessions of the Forum the participants discussed each alternative energy direction in depth, their perspectives and risks. The overall conclusion was that the Ukrainian government has already adopted an array of regulatory incentives to stimulate the green energy market. For instance, a favorable feed-in-tariff for green electricity has been introduces along with zero corporate income tax on 50 % of income until 2020, 0 % VAT until 2019 and 0 % customs duty on imported equipment, a preferential connection to the grid. This green tariff is pegged to the euro to cover local currency risks. According to the key market players alternative energy projects are considered to be a high yield investment with short payback periods. Depending on project size and energy production type, energy generation plant may start to yield revenue after as little as 3-4 years from the start of operations with IRR up to 35 %. The Forum subsection on the specifics of wind energy market development and upcoming prospects in Ukraine and the CIS the members of the wind energy market agreed that while wind power is the most widely used alternative energy source in Europe, in the CIS region Ukraine is the leader in wind-generated energy. According to the Wind Energy Association, the wind energy potential of Ukraine is estimated at 30,000 GWh. However, the market remains at the level of 300-320 MW only, developing only a negligible part of its full potential. The high wind power generation potential, 0,11 Euro/kWh feed-in-tariff, favorable legislation and tax benefits make Ukraine one of the best countries in Europe for the construction of wind power plants. Dr. Johan Harter, COO of Activ Solar during the specialized panel entitled ‘Solar reload: the new stage of PV projects development in Ukraine’ spoke about the Perovo and the Okhotnikovo Solar Power Stations (105.56 MWt and 82.65 MWt respectively), the biggest solar power plants in Ukraine and one of the biggest in the world developed by the company. He predicted that Ukraine is expected to commission 400 MWt of new solar power capacity by the end of 2013 and 500 MWt per year in 2014 and 2015. Even thought Ukraine has the highest 0,46 Euro/kWh ‘green tariff’ in the CIS and is the absolute leader in the region in installing solar panels, the overall solar energy input in the national energy balance is only 0.3 % with a lot of room for development. The number of solar energy projects has increased significantly over last 5 years and the sector continues to grow by up to 50 % annually, therefore solar market is one of the most dynamic and promising. Due to the developed agricultural infrastructure, Ukraine has impressive potential for biomass energy production. The OECD has named biomass one of the most attractive sectors for foreign direct investments in Ukraine. According to Ukraine’s energy balance, the share of biomass in the total primary energy supply is only 1.24 %, whiles there is an opportunity to increase this number up to 10 %. The Head of the Board, Bioenergy Association of Ukraine Georgiy Geletukha commented that the full potential of the sector could be developed only with the abolishment of requirements concerning the local content share for the facilities that generate power from biomass, biogas, municipal waste, and via co-firing of biomass with fossil fuels. The total power generated from small rivers and other water sources comes up to 0.23 % of all electricity produced in Ukraine. However, the potential of small hydropower plants in Ukraine can reach up to 4,8 % of the total electricity generated in the country. Apart from the clear-cut economic effects, which include increased industry efficiency and reduction in energy-related public expenses, alternative-energy investment has also long-run social effects. Ukraine is one European country most interested in green investments and alternative energy developments, promising high yields within short payback periods. Moreover, the Association Agreement with the EU will open Ukrainian market and make it more attractive for direct investments in wind, solar, hydro and biomass production.